A future England –but not very far in the future. A gang of kids on a perilous journey through a country that will lock them up first and ask questions afterwards. 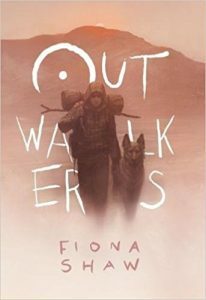 They must live on their wits, all of them – even Jake’s dog, Jet – and they must work as a gang to survive. This is a great, heart-stopping adventure for 12-plus about a burning hunger for freedom that shakes the soul with its contemporary political echoes. It has a moral compass that should put it bang in the centre of our kids’ imaginations. Gripping, action-packed, but with moments of tenderness, Shaw’s first YA novel tackles contemporary issues, balancing them with timeless themes of love, loyalty and freedom. The picture of England which Shaw creates is at once recognisable but also truly horrifying and all too plausible…This has the feel of a post-Brexit novel yet I can see it staying relevant for years to come. Shaw tackles difficult moral issues and her characters have to make uncomfortable and frightening decisions. Their naivety is often exposed as a weakness and the child’s willingness to trust sometimes leads to great danger. Now more than ever, people of all ages are reading young adult books, and some of the best writers around (like Shaw) are providing them… I very much hope she is working on a follow-up to this. The detail in the world building… makes this book so impactful. Hours and days after putting it down, I found certain images stayed with me … The plot is gripping and the hard hitting nature of the book meant I was in constant fear that one or more of the gang were not going to make it to the end of the story…This is a beautifully written, powerful and moving story that will appeal to teens and adults alike.